Piano Life Saver System the system that will double the life of your piano and allow you to enjoy a nice tuning all year round. The Piano Life Saver System is silent and installed out-of-sight inside your piano. Each Piano Life Saver System carries a 5-Year Warranty which can only be activated by having the System installed by a piano technician. 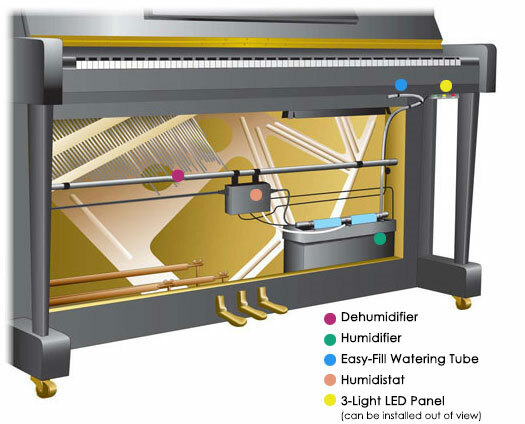 the System to function as a Dehumidifier or Humidifier to protect your piano from damage caused by changes in humidity. refilling the Humidifier is simple and easy. when the pads are no longer wicking water indicating they should be replaced.